AN EASY REACH WITH HUSQVARNA HEDGE TRIMMERS. The Husqvarna 115iHD55 Hedge trimmer is easy to use, easy to handle – and quiet enough for seasonal use in residential areas. Comfortable and durable, it offers powerful performance with no direct emissions. Safe, convenient starting via the intuitive keypad, efficient brushless motor with savE™ function for extra runtime and long-lasting Li-ion battery make it a great choice for homeowners. CORDLESS FREEDOM: No petrol, no engine noise, no direct emissions and just a push on the trigger to go. The powerful 36V Li-ion battery pack is designed for reliable, long lasting use, designed to be recharged hundreds of times. 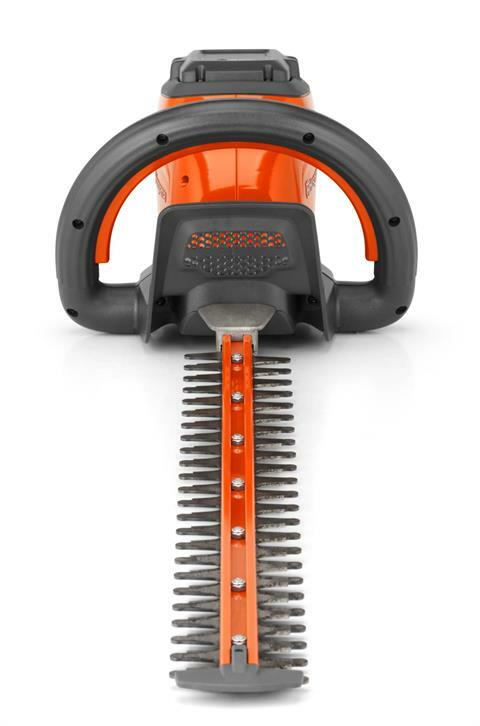 The Husqvarna battery family for the aware consumer includes both a grass trimmer, chainsaw, and a hedge trimmer. BRUSHLESS MOTOR: High torque to weight ratio for increased efficiency, increased reliability, reduced noise and longer product-life. DURABLE GEARBOX: Durable gearbox in aluminium for efficient cooling and long product life. WELL BALANCED: Well balanced for easy handling. QUIET OPERATION: The low noise provides a comfortable work situation and low disturbance for others. LIGHTWEIGHT AND ERGONOMIC DESIGN: Models in the Battery 100 Series have a compact, slimmed-down design for excellent ergonomics. This makes them lightweight and well balanced – allowing you to work comfortably in your garden. Without battery - 7.3 lb. With battery - 9.9 lb. Recommended maximum twig diameter - 0.63 in. Cutting - 3,000 cut / min.